Yesterday, I wrote about my cousin and his potential investment in a horse property. 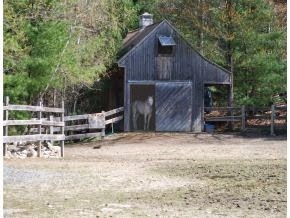 He wanted to know if it was a good horse property, and in particular whether it was realistic to lease out the barn + pasture to a horse owner in the area. – At 1.32 acres, and only .75 acres fenced in, it’s extremely small as a horse property. The pasture would always be a dry lot, and manure removal would be constant. Soil remediation would be necessary on a semi-regular basis. – If he were to find someone to lease the barn, he’d have to write up a fairly strong contract and I’d help him work on that, but it would have to include things like who’s calling the vet, what their obligations are as owners/lessors, who’s responsible for what maintenance, and he’d probably have to provide a space for trailer parking. – I ballparked a guess at $100/month per horse for the lease, based on what I knew of the area and what he was offering. I gave him the information for the tack shop, where he could both advertise the space and get good local market advice. – In short, he’d have to be really careful at screening whoever he got, if he could get anyone interested. I explained to him in the strongest possible terms that horse people are crazy, and that he’d have to be prepared for that. He’s a longtime landlord, but I said to him, no, think way crazier. – I also told him that I was far from an expert, but he’d have to seriously explore changing or increasing his homeowner’s and/or liability insurance with all possible contingencies covered. – That said, I DO think he’d find someone to lease it. In conclusion, however: I don’t think the time, expense, and worry would be worth it unless everything worked out perfectly, and, well, horses. No such thing as working out perfectly. I advised him against leasing the barn and pasture out on a longterm basis. However, here’s what I think has real potential: I think this could be a really ideal rehab or short-term situation. If he made the right contacts at the tack store (and actually I’d be happy to do that for him, as it’s an awesome tack store with good people) he could be in a great place to provide a space for someone whose horse needed 3 months of inexpensive stall rest, or limited turnout, or someone who was in a bad place and loved their horse but needed a place to put them for a month or two. The absolute least hassle solution is simply to maintain the barn, pasture, and fence. Use the barn as storage – and as a real estate guy, he’s always got a ton of extra stuff that’s going in and out of new apartments – and spend some real quality time remediating the pasture, planting good grass to revitalize the turf. Keep it looking sharp, and yeah, down the road, someone probably would buy it as a horse property. How do you think I did? Agree, disagree? Previous Post See, I wasn’t just whining: coldest winter EVER. Disagree. What happens when a tenant abandons the horse? What if the horse gets out and gets killed, or kills someone? Too many variables that can't be sogned away with waivers. Renting to horse people only works when you have the right person, I think it's too risky. Jmho. I wouldn't rent it if I were him in any situation, but I think your advice to maintain all the fencing and barn to later sell as a horse property is a good one. I'm a real estate agent specializing in horse properties. 🙂 So, in my professional opinion, I'd have to say NO. Based on the acreage alone, that is WAY too small for horses. Depending on township zoning, horses may not be (and probably are not) allowed on a lot that small. A general rule to follow is 1 acre of fenced pasture per horse – this property doesn't even have space for 1 horse, honestly. 3 acres would be the absolute minimum I would advise for keeping horses, and in many townships near me the minimum is 5. Plus, with a tiny barn and a tiny amount of “pasture”, you just can't make money by renting a place like that – it has little to no value for someone looking to rent a barn. NOPE! Move on!